After my recent realization that the sheer size of the historical LEGO parts inventory means sourcing parts is better done planned than by shooting in the dark, I set out to really try the best tool of the trade: BrickLink Wanted List. I have discussed this feature before, but I haven’t really used it until now. Turns out, I probably should have. It’s great. One major issue with manually browsing BrickLink is locating the optimal seller: one that has all or most of the parts you seek, ships to your region, has suitable (or no) minimum purchase limits and is otherwise fair and reputable. During my Quest for Lion Knights’ castle, I merely started off by doing some manual searches and then homing in on some larger seller that looked the part. It is very, very hard to find as wide a selection as possible in this manner, though, resulting in some unoptimal orders on my part Same with Quest for Inter-City thererain. The great thing about BrickLink is (well, one great thing, there are many), it actually has a feature just for this purpose – the above-mentioned Wanted List. Using the My Wanted List for locating specific parts is easy: Login from the top right corner (register first, if you haven’t already). From the main navigation bar, click Wanted. On the Add Items to My Wanted List, select Parts and Submit. If you have a part number, e.g. from a Peeron listing, just enter the Part Number or search by Category. Once the part has been entered, select condition, color, quantity and price limits, and press Add Item. Repeat as many times as necessary. Once your list is up to speed, simply click By Shop from the secondary navigation bar. From this list you can browse reputation, store size, location and minimum buys. What’s best, as long as the list is sorted by Lots (you have a few different options), the list shows all those stores first that can best complete your wanted list. Clicking the store name will take you to a page that shows all the available parts and let’s you fill in a shopping cart. To auto-fill a cart, press Auto-Fill Cart Max/Min (Max as many as available, Min as few as you’ve set) and then Add Selected Items to Shopping Cart. You can also add to the cart manually before pressing the Add button. See also My wanted list for more notes on e.g. how to “part out” an entire set to the wanted list. 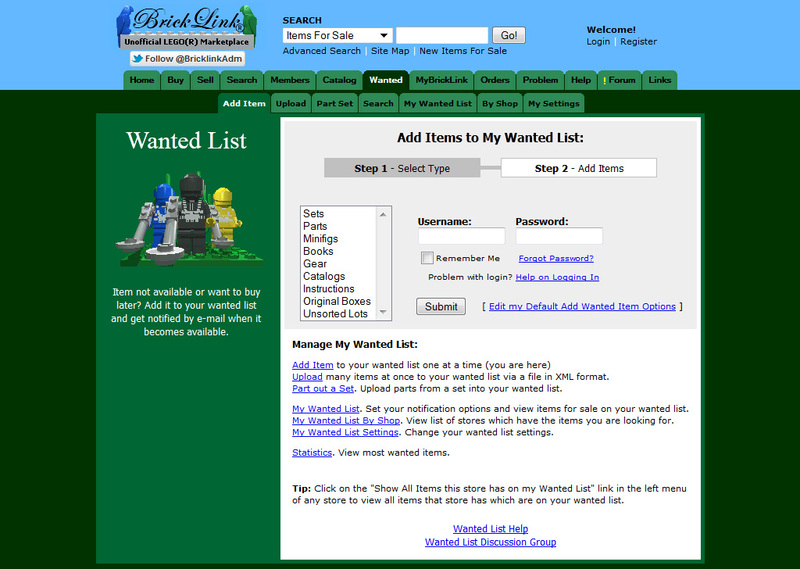 For mass hunts, you can also upload XML lists to BrickLink, instructions for that are here.